For more than 130 years, smart, strong women have come to Bryn Mawr College to seek an unparalleled education and meaningful opportunities to contribute to the world. That tradition continues and grows today. Bryn Mawr offers a university of academic opportunities in an intimate setting; a close, connected community that fosters lifelong connections; and the preparation women need to lead. On our historic and verdant suburban campus 11 miles from Philadelphia, a world-class faculty guides and challenges 1,350 undergraduate women and more than 400 graduate women and men from 45 states and 62 countries. Bryn Mawr is a place where teaching is valued, each student is known, and students and faculty members form close bonds. Superb opportunities for independent and faculty-sponsored research, core seminars, connected, interdisciplinary courses, and access to 37 majors, 48 minors and 4 concentrations enable each undergraduate student to create her own academic program. 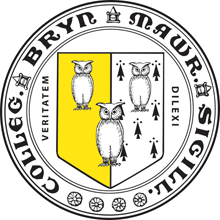 Bryn Mawr was the first women’s college to offer graduate education through the Ph.D., a signal of its founders’ refusal to accept the limitations imposed on women’s intellectual achievement at other institutions. Our outstanding graduate programs — offered to both men and women — add to the intellectual dynamism of our community. Longstanding partnerships with Haverford and Swarthmore Colleges and the University of Pennsylvania give Bryn Mawr students a broad variety of curricular opportunities. The Bryn Mawr experience is marked by enduring traditions and fresh possibilities that balance academic seriousness with fun. Each year, we come together to celebrate distinctive traditions such as Lantern Night and May Day that make being a student here unique and memorable. Bryn Mawr’s reach extends far beyond our classrooms and our campus. Our location offers students access to the cultural resources of a major metropolitan area and the broad diversity of Bryn Mawr students, faculty, and alumnae/i creates a global community that fosters international experiences, friendships and networks. Engaging in scholarship, research, internships, and work around the world is the norm here and a source of both joy and pride. As it always has, Bryn Mawr builds both independence of mind and respect for the power of collective endeavor. Our honor code stresses mutual respect and academic integrity, and student government is exceptionally strong. These campus customs offer students firsthand experience of collaboration, responsibility, and leadership. Learning beyond the traditional classroom helps students develop strategies for teamwork and big-picture thinking. We are known for our outstanding record in placing students in graduate and professional schools, as well as our efforts to connect graduates to other promising career opportunities through LILAC, our Leadership, Innovation, and Liberal Arts Center. Some 22,000 alumnae/i, leaders in fields too numerous to mention, form a powerful lifelong network for our graduates. Bryn Mawr connects women — to ideas, to opportunities, to one another, and to the world.